In my production environment, some workstations are installed 32 bit and 64 bit Windows 7 professional, but the file and print server is still using Windows Server 2003 32 bit standard. I have to install the printer driver and add additional print queue in the server for both Windows 7 32 bit and 64 workstations. Assuming I have to add network printer. 1. At Windows 7 workstation, log in as Domain Administrator. 2. 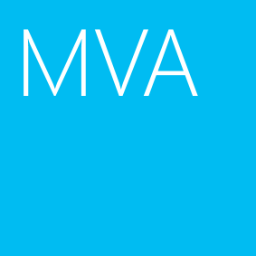 Click "Start", enter "mmc". 4. Select "Print Management", click "Add". 5. Under "Add servers", type the name or IP which is the print server. 10. 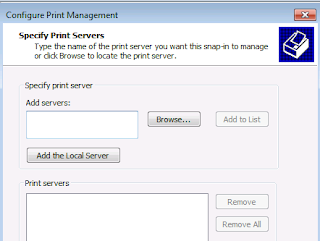 Expand "Print Management > Print Servers > <IP or Server name> > Printers"﻿. 11. Right-click "Printers", select "Add Printer". 12. Select "Add a TCP/IP or Web Services Printers by IP address or hostname", click "Next". 13. At "Printer Address" screen, type the IP address of the printer. 14. Un-check "Auto detect the printer driver for user". 16. At "Printer Driver" screen, select "Install a new driver". 18. Provide the printer driver of Windows 7 32 bit , click "Next". 19. You can change the "Printer Name"﻿ and "Share Name", click "Next" twice. 21. At left pane, right-click "Drivers", select "Add Drivers". 22. At welcome screen, click "Next". 23. Un-check "x86", check "x64". 25.﻿ Click "Have Disk" to provide the x64 driver of the above printer. As a result the Windows 7 printer driver was installed in the Windows Server 2003 print server.